(Jesus said) 1 “Do not judge, or you too will be judged. 2 For in the same way as you judge others, you will be judged, and with the measure you use, it will be measured to you. Unspecified in Bible text, daytime. Simple lighting from the left illuminates this scene. A Hebrew male tailor attempting to measure a cross looking woman. 01) (This page) Matthew 07 – Judging others – Scene 01 – Measure (Version 01). In which the background colours transition from a pale fawn brown at the bottom to a pale yellow at the top. 02) (Next page) Matthew 07 – Judging others – Scene 01 – Measure (Version 02). In which the background colours transition from a pale earth brown at the bottom to a mid sky blue at the top. When I read the words “…with the measure you use, it will be measured to you” I immediately thought of a tailor using a tape measure to measure up for a suit of clothes. Initially I had the tailor measuring a woman’s head, with her looking crossly at him, since he might be trying to “measure” her intelligence! But I decided to change that idea to the tailor reaching around the woman to measure her vital statistics. 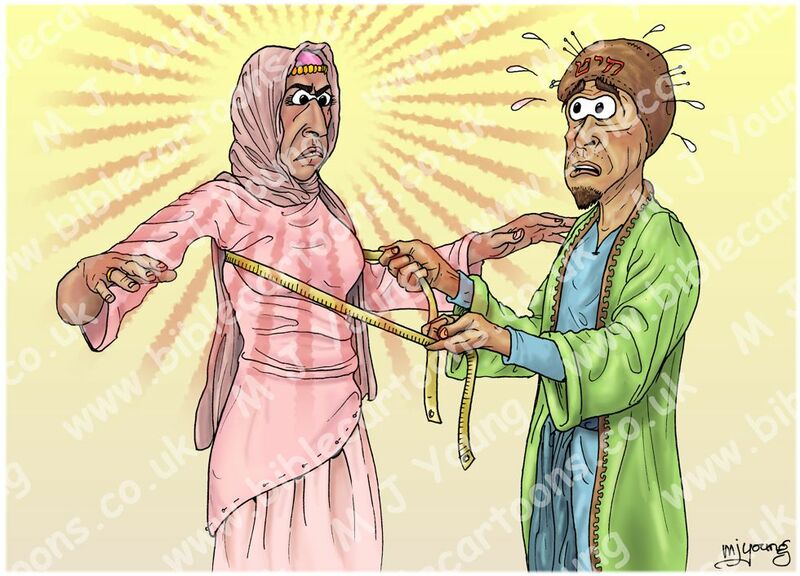 The radiating red lines, coming from the woman’s face is my way of visually representing her anger/mistrust towards the tailor & his measuring hands. Notice the tailor’s leather cap, which not only has the Hebrew word for “tailor” is emblazoned in large red lettering, but it also has blue pins stuck in it, demonstrating the man’s profession of tailoring! Notice also that the woman’s dress has the same blue-headed pins on one of the lower skirt seams, showing that the tailor is measuring to make adjustments to this unfinished dress. This is, of course, a very tongue-in-cheek interpretation of this Bible passage. My drawing is a play on the word “measure”. I was merely looking for a humourous way to employ the word “measure”; the scene doesn’t really illustrate the point Jesus was making to his audience. Clearly Jesus was talking about attitudes of our hearts, & hypocrisy in particular, not the actual measurement of dimensions! But I hope I will be forgiven for my light-hearted interpretation of this important message of our Lord. In fact Jesus was here (Matthew chp 7) giving an illustration of Pharisaic practices regarding judging others. The Pharisees were actually judging Christ, rejecting him and concluding that he was inadequate, primarily because he was not offering them the kind of king & kingdom they wanted. The Hebrew people really wanted a warrior-king who would fight & release them from Roman occupation, whereas Jesus was preaching the Gospel message of love, which was (& still is!) radically different from what many people want.